The notice below the sign announces a July 10 public hearing on the Hickory Hollow project. Building apartments in North Albany is tougher than the zoning makes it appear, as shown by an appeal against the first such project the city staff has approved. In May the Albany planning staff had approved a site plan for “Hickory Hollow,” a 48-unit complex of four three-story apartment buildings on 2.25 acres north of Hickory Street, west of North Albany Road. The zoning of the parcel allows apartments, and the staff determined that the project met the requirements of the Albany development code. What the neighbors would like, according to a letter bearing the names of 14 individuals or couples, is for the two planned apartment buildings closest to single-family houses to be reduced from three to two floors. That would presumably reduce the number of units in the project to 40. “We request this change to make the proposed complex more compatible with existing surrounding development in the area,” the neighbors’ letter said. The appeal cost the neighbors a $269 filing fee. They probably figure it’s worth not having people looking down into their back yards from the third floor. In response to the appeal, the Albany Planning Commission has scheduled a public hearing on the site plan for 5:15 pm. Monday, July 10, at City Hall. 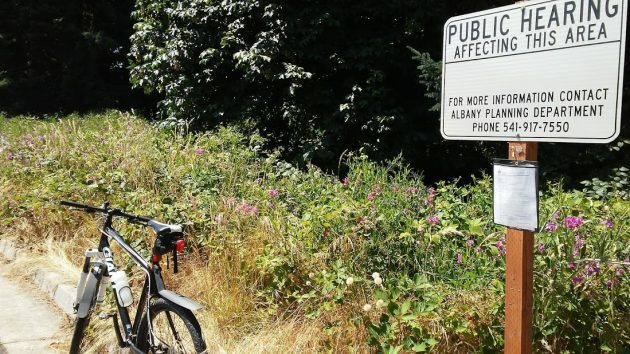 I had followed the Hickory Hollow project since January, but (not living in the area) I wasn’t aware of the appeal and scheduled hearing until I rode my bike past the property this week and saw the public notice among all the brambles. Just goes to show you it pays to notice signs and stop to read what they say. One ought take pity for the downtrodden North Albanians. After all, their once pristine section of paradise is about to become home to the “Great Unwashed,” folks who do not own their home. Soon, North Albanians fear, the affected neighborhood’s will be cluttered with wrecked cars that never move, rotting 5th Wheels that melt on the street, gap-toothed children who may or may not respect the North Albany ethos. Yes, the North Albanians are screaming, “Not in my backyard.” There is no room for renters in the rent-free, virginal plat that is North Albany. Just wait til Walmart decides to move in. Oh there are plenty of rentals in N.A. Simply wait for that first wave of sellers of all the new construction. It is happening now as “investors” swoop to buy the for sales. No longer owner occupied could lead to that which you describe JH. Depicted so perfectly. If you want to see the parking problems, come to the 1600 block of Oak St. S.E. . There’s not enough parking for the residents, so they park on the street.